A team of laboratory astrophysicists from Leiden University (the Netherlands) managed to make glycerol under conditions comparable to those in dark interstellar clouds. They allowed carbon monoxide ice to react with hydrogen atoms at minus 250 degrees Celsius. The researchers published their findings in the Astrophysical Journal. In recent years, increasing numbers of complex molecules have been identified in space. Their origins are still under debate. Gleb Fedoseev, now a postdoc at the Osservatorio Astrofisico di Catania in Italy and the first author of the article, says, "The density of particles in space is extremely low and carbon monoxide is highly volatile. However, it freezes out on small dust particles at temperatures below 250 degrees Celsius, where it acts as the seed for larger and more complex molecules once it starts interacting with impacting hydrogen atoms." In 2009, the Dutch researchers, using their cryogenic hydrogen bombardment setups, showed that carbon monoxide upon hydrogenation reacts to form formaldehyde (four atoms) and methanol (six atoms). By 2015, it became possible to make the sugar glycolaldehyde (eight atoms). And now, it is possible to form glycerol (14 atoms). Harold Linnartz, head of the Sackler Laboratory for Astrophysics at Leiden University, says, "If you systematically allow reaction products along this reaction chain to react with each other, more complex molecules are formed. We now have reached the level of glycerol, two levels higher and we have ribose, a sugar that is important in the coding of our genes." The big question now is whether glycerol is also present in interstellar clouds. 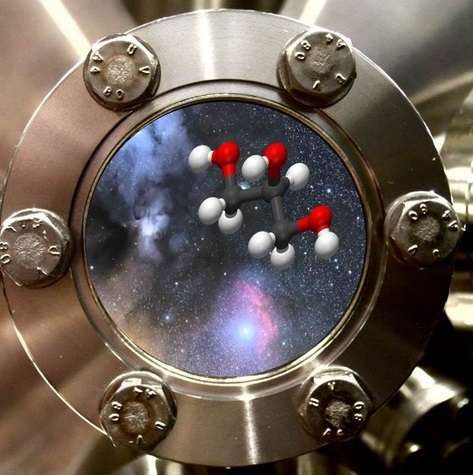 The molecules of formaldehyde, methanol and glycolaldehyde have already been detected by telescopes in the interstellar clouds of IRAS 16293-2422. This is a star forming region in the constellation of Ophiuchus at a distance of 460 light years from Earth. The young stars emerging here resemble our sun 4.5 billion years ago. The goal for the next year is to use ALMA, the world's largest radio telescope, to search for molecular fingerprints of glycerol, exactly there where also its precursors were identified. Ewine van Dishoeck (Leiden University): "The more complex the chemistry in an early evolutionary stage of a star, the greater the chance that the building blocks of life were already available before planets were formed." Glycerol, C3H8O3, is an essential component of living cell membranes and it is the molecular backbone of numerous chemical and biological compounds. Glycerol is also included in cough drops, suppositories, toothpaste, shampoo, soap, candy and margarine. On Earth it is easy to produce, but in space the circumstances are clearly different. That's the reason why laboratory experiments are needed to simulate the processes at play.